TSSAA Dead Period Rule – No coaching, observing, or contact between coach and players in sport involved. There is no practice, no open facilities, and no weight training/conditioning. The Dead Period, which is to be observed by all schools, is June 24 through July 7 this year, a total of 14 days. Being a high school head football coach is nearly a year-round job. With the TSSAA’s two-week Dead Period Rule getting underway June 24, what would local head coaches be doing during this time? Some may be on a vacation with their family. Some may be catching up on things needing done around the house. Some may be just taking it easy a few days before a busy new season begins after the dead period. The Clark Duncan family traditionally takes a vacation during the TSSAA dead period. That changed this year, along with maybe a few diapers. “This year we stayed home and welcomed my grandson to the family, Shepherd “Shep” Hayes Hennigan,” said Duncan, South-Doyle’s head coach and also an assistant principal and the athletic director at the school. Kendal Hennigan gave birth to Karen and Clark’s first grandson at Fort Sanders Medical Center on Monday, June 25, “11 days early,” noted Duncan. The hospital room was full of love and smiles. “It’s great!” said Coach Duncan. Now about those diapers and what about traditional cigars to mark the new arrival? TRAVIS MOZINGO, Christian Academy of Knoxville’s head coach, was over 2,000 miles away when he received The Focus’ inquiring email last week. “It’s only appropriate that your email arrived as I am on Amtrak’s Coast Starlight Train, a 36-hour train ride from Los Angeles to Seattle,” replied Mozingo. The CAK coach and Beth celebrated their 20th Wedding Anniversary this past winter and made plans to add on a celebration trip out West during the TSSAA Dead Period. 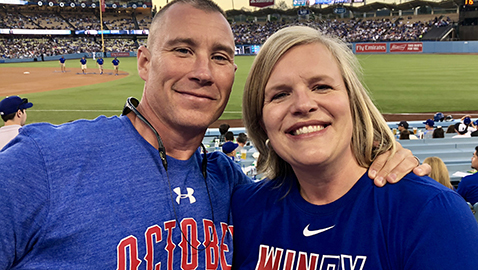 “She’s a die-hard Chicago Cubs fan, and I wanted to take a train trip … We compromised: A trip to LA to see the Dodgers and Cubs series, and then take my desired train trip to Seattle,” said Travis. “After a few days in Seattle, we’ll head back to my wife’s hometown in rural Illinois farm country for the 4th of July, and then head back to East Tennessee. By the way, the Cubs lost 2-1 the night the Mozingos were at Dodger Stadium, but won two of the next three for a split in the series. “Beth was pleased with that!” noted Travis. Carole and Steve’s sons are Steven 8 and Lucas 5. RUSTY BRADLEY, Grace Christian Academy head coach: “I intentionally got all of my work done before the dead period so I could take the dead period off. “I traveled to Birmingham for three days and Atlanta for two days. Other than that, I did nothing but lie around and enjoy some downtime before things crank back up on July 9. Eleven years? Wow. The Shinlever family must really like this vacation spot! “I married into it,” replied Shinlever. Julie and Morgan have two children, Davis 5 and Lawson 3.